Las Vegas' Chinatown, a three-mile stretch on and around Spring Mountain Road west of the casino-laden Strip, is a lot more than just a place for Chinese food. "I would say that Las Vegas is more of an 'Asiantown,' not a Chinatown," says Martin Koleff, the restaurant stylist who helped create Vegas Chinatown restaurants including beloved izakaya Raku. "Like in Japan, you go to Chinatown in Yokohama, they're all Chinese restaurants. 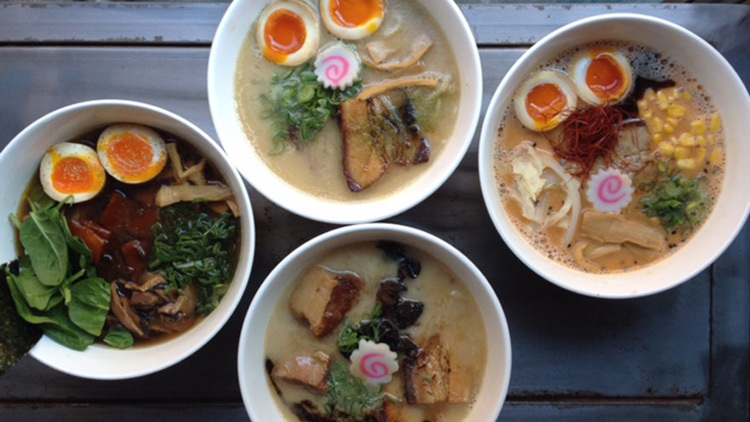 You can't even find a ramen shop." In Vegas' Chinatown, you'll find plenty of ramen, including the fabulous tonkotsu, shoyu and miso noodle bowls at Monta, another of Koleff's restaurants. You'll also be able to try world-class sushi, udon, Thai food, pho and Korean barbecue along with all kinds of regional Chinese food (Cantonese, Szechuan, Yunnan, Hunan, Dongbei and more). "It's three miles long, 150 restaurants, six large Asian grocers," says Joe Muscaglione, a partner in the Vegas Chinatown's Niu-Gu, known for its upscale riffs on Chinese-food classics and its traditional Gong Fu tea ceremonies. Muscaglione, who used to work in New York as beverage director at Mario Batali's Babbo, also runs Chinatown Report, a site that tracks Chinatowns around the world. "You don't have the alleys in Vegas, you don't have the history of other Chinatowns," Muscaglione says. "But as far as food, we have the best of any Chinatown in North America, and that includes Vancouver." Muscaglione is making a bold statement, but it's hard to argue against the diversity in Las Vegas. Beyond the Asian food, you'll also find great bars that never close, dodgy-looking video-poker lounges, all-night massage parlors and even a new outpost of The Halal Guys that serves until 4 a.m.
"I love Chinatown, it's got all the perfect seedy, underworld-esque elements," says Branden Powers, who runs The Golden Tiki, a 24-hour pirate-themed drinking wonderland that sells Dole Whip (with and without alcohol) by the hundreds every night. "It reminds me of New York and Amsterdam. I love the energy, it's nonstop. You can go to [Vietnamese restaurant] Pho Kim Long at four in the morning and it's going to be busy." This Chinatown is only getting busier and buzzier, and the major operators here are ready to raise their bets. Koleff says that Raku, which opened in 2008 and has since expanded from 25 seats to 49 seats, is working to add a patio space. Muscaglione wants to move Niu-Gu to a larger location and is planning to open a separate tea lounge. Powers, meanwhile, is looking to create more bars and restaurants in Chinatown. This all makes sense. I've been eating in the Vegas Chinatown for a decade and have seen crushingly long waits for restaurants at both 5 p.m. and 2 a.m. I've also spent many evenings bouncing to different eating and drinking establishments because this Chinatown is really built for a food-and-booze crawl. In fact, you can spend multiple nights feasting and stumbling around just one strip mall and still feel the need to come back and see what else is there. Here are our power rankings of the three most delicious and fun Vegas Chinatown strip malls, where—as you can imagine by now—Chinese food is just a small part of the action. Raku, the late-night destination Mitsuo Endo (the former executive chef at New York's Megu) opened in 2008 and continues to preside over, is Japanese food bliss without sushi or ramen. 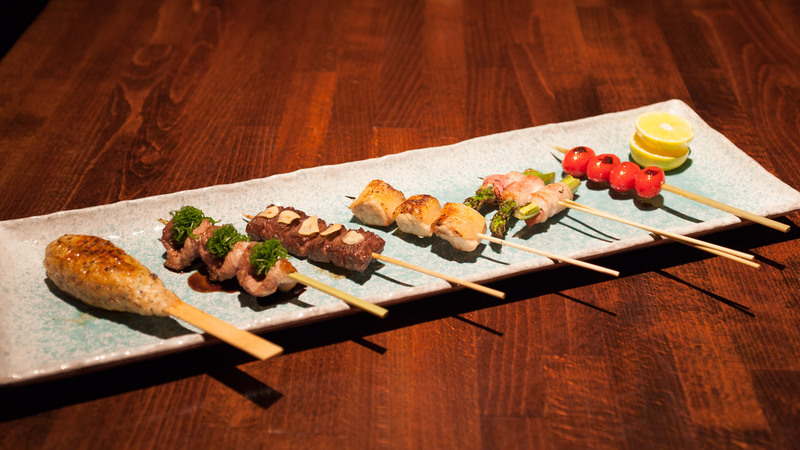 Endo's izakaya, with its deep sake list, serves perfect tsukune (ground chicken skewers), soul-warming agedashi tofu and straight-from-Japan seafood that the chef turns into glistening sashimi. Go after midnight and you might just see a famous chef—perhaps Mario Batali or Guy Savoy or Joël Robuchon or Wolfgang Puck or Michael Mina—winding down with plates of grilled vegetables, kobe beef tendon and pork cheek while sipping one of Raku's 100-plus sakes. Restaurant consultant Martin Koleff, who left Tokyo for Vegas when he was hired as the general manager for Steve Wynn's Okada restaurant (which has since turned into Mizumi), remembers opening Raku. This was a restaurant that took off thanks to early word-of-mouth from chefs who cooked at huge casinos—that's how I grew to love Raku. Longtime Wynn chef Paul Bartolotta was an unofficial ambassador, bringing me and many others to Raku multiple times. ("Paul spread the word," Koleff remembers. "He really liked the food.") But, I was first introduced to this restaurant by the late Palms chef Kerry Simon, who took me there soon after it opened. Raku shares a Spring Mountain Boulevard strip mall with sister lounge Sweets Raku, which serves dessert tastings that include an edible menu made of rice paper. There's also the rich ramen at Monta, the pristine edomae-style sushi tastings at Kabuto, the Italian-Japanese fusion at Trattoria Nakamura-Ya (try the uni pasta) and the katsu at Curry Zen. (Sweets Raku, Monta, Trattoria Nakamura-Ya and Curry Zen are also part of Koleff's portfolio). When Raku opened, there was a coin laundry and a Mexican marketplace in the strip mall and not much else. You can't wash your clothes or buy cotija cheese here anymore, but there might not be a better collection of Japanese restaurants in any other complex outside of Japan. It's not just Japanese at this strip mall, though. Hwaro is a popular Korean barbecue spot. (BTW, this strip mall is actually known as Seoul Plaza, but everyone just thinks of it as "where Raku is.") I've also eaten at the delightful and astonishingly affordable Big Wong at least as often as I've dined at Raku, which is saying something, because I've gotten off a plane and gone straight to Raku no fewer than five times. At Big Wong, Wai Lee and his wife Connie are re-creating the food they grew up eating in New York's Chinatown. 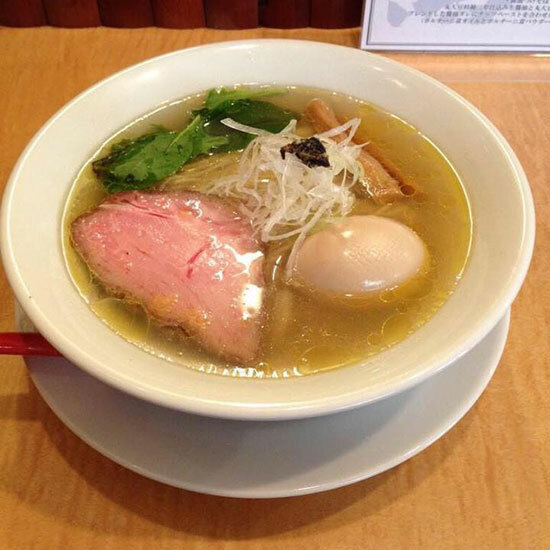 When he opened in 2011, Lee charged $4.95 for meals like a Taiwanese-style pork chop with rice, gravy and an egg that's a hybrid of a tea egg and a ramen egg. He's only raised his prices by 50 cents since then, so $5.45 can also get you a plate of Taiwanese-style fried chicken, a generous bowl of shrimp wonton soup or a comforting serving of thin-sliced rib eye over pasta. A dollar more gets you a wondrous bowl of steamed chicken with Chinese sausage and mushrooms. "I drive down to L.A. to pick up my seafood and meat," Lee says. "The key point is quality food at the right price. It makes me feel good when customers say, 'Wai, you gotta raise your prices.' "
But Lee remembers walking down Mott Street in New York, where food was cheap and competition between restaurants was fierce. He still holds onto a time where five bucks buys you an abundant meal even though he's next to Kabuto, where omakase dinners start at $48 but many guests spend more than $100. That's one great thing about Vegas Chinatown: It's got something for everyone, often at the same address. This strip mall lives up to its billing as The Center at Spring Mountain. There's Pho Kim Long, a Vietnamese place that's been popular with locals and visiting poker players for years. There's the new Marugame Monzo, an outpost of a top-tier Los Angeles udon restaurant. There's chef Bank Atcharawan's Chada Street, which has a strong wine list, pleasantly funky Thai sausage and, best of all, phenomenal fiery crispy catfish with chili paste. But the hottest spot at The Center (across the street from a strip mall where The Halal Guys opened) is, in every sense, Chengdu Taste. Chengdu Taste is hidden behind Spring Mountain Road. Getting there involves driving into a parking lot around the corner from most of the other restaurants in the same strip mall—you'll know you're there when you see all the tour buses parked out front. Chef Tony Xu's Chengdu Taste, an outpost of a widely ambitious L.A.-based empire, will make your mouth numb with its cumin lamb on skewers and its boiled fish with green pepper sauce. You might find yourself at a communal table next to a couple eating frog with tofu pudding in hot sauce, while a solo diner slurps dandan noodles. 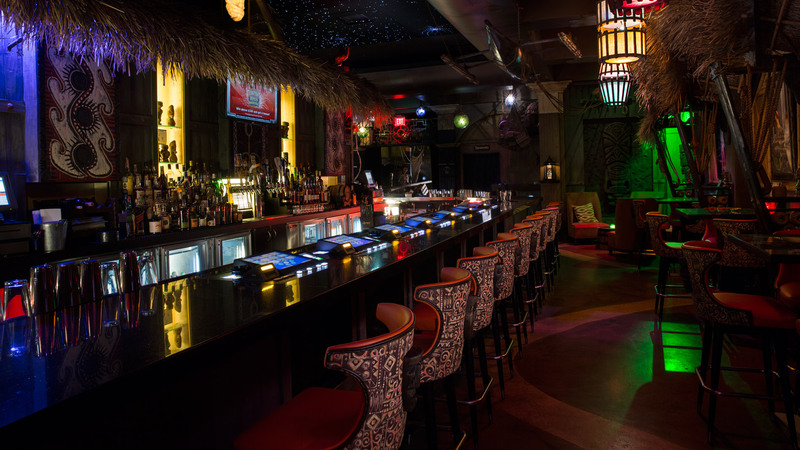 When you're done, you can head over to the main part of the strip mall and cool your palate with a cocktail, a punch bowl or Dole Whip at The Golden Tiki. The Jones Boulevard strip mall is packed with quality Chinese food: It's where you can sip sustainably sourced teas and eat squid-ink fried rice, miso-flavored beef-noodle soup and organic housemade tofu at chef Jimmy Li's Niu-Gu. China Mama is known for noodles and dumplings, and Niu-Gu partner Joe Muscaglione swears by the duck at the popular and simply named Asian BBQ & Noodles. Beyond that, there's the original Chada, known for some of the best Thai food in town as well as a sharply curated wine list that rivals casino restaurants. District One serves chef Khai Vu's modern Vietnamese food—including pho made with a whole Maine lobster—and has a lively bar scene. Chubby Cattle, which bills itself as the world's first restaurant with a refrigerated conveyor belt for hot pot ingredients, has swish-worthy premium beef and seafood that you cook yourself at your table while the kitchen grills cumin lamb skewers.